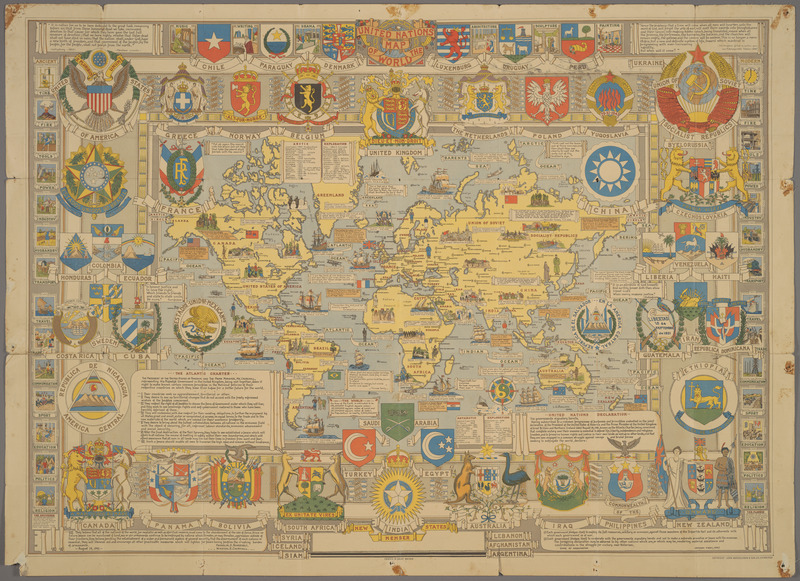 A pictorial map honoring the United Nations, mounted on cloth and intended for schools. The map is in many ways an update of MacDonald Gill's 1945 "Time & Time Map of the Atlantic Charter," ID #2015. The Atlantic Charter is reproduced in full, along with the portion of the U.N. Declaration referring to the Charter. The map bears the names of all 55 member countries of the U.N. as of the end of 1946, with a blank space at the bottom center anticipating the addition of "New Member States." The national emblem of most member countries is shown on the map|those of the U.S. and the U.S.S.R. are the largest. Altogether, "a lavish visual celebration of the establishment of the United Nations." Curtis 2016, 221. The land and seas are covered with pictorial images honoring historical events, as well as quotations from the Bible and a wide variety of philosophers, writers, political leaders and others (many British). In the left margin are images of everyday life from "Ancient Time" (tools, industry, travel, education politics, religion, etc. ), and in the right margin images of the same activities from "Modern Time." In the lower corners are explanations of "The Universe" and "The Planets." L.G. Bullock was a British civil servant who produced several children's maps in conjunction with Bartholomew. This map has been called "a wonderful example of postwar optimism." (Byers, Tim. "Leslie George Bullock: cartoon maps for children." Unto the Ends of the Earth Blog, June 24, 2014, http://timbryars.tumblr.com/post/89739376810/leslie-george-bullock-cartoon-maps-for-children, accessed January 20, 2015).